Red velvet cake has become a favorite at my house. Over the years I have worked on refining my favorite red velvet cake recipe to find just the right balance of moistness and crumb with the perfect marriage of cocoa and red food coloring. I think this red velvet cake recipe does just that, and just in time for holiday baking. This post contains affiliate links for your shopping convenience. When you shop through one of these links I receive a small compensation that helps support publishing this blog. 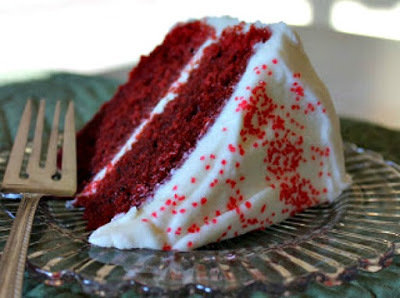 What could be better than a red cake? Nothing at all. The red cake makes it special with the taste of chocolate that is sure to please. It is perfect for many holidays throughout the year. Christmas, Valentine's Day and all the patriotic holidays are made more festive with a red velvet cake. 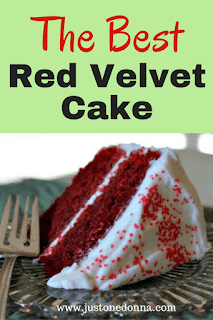 Are you looking for the best red velvet cake recipe? After trying multiple recipes for red velvet cake I chose this one as the best because it is very moist. That comes from the oil used in the recipe instead of butter. Butter, while tasty, can often make the texture of a cake a bit too dry. Try this red velvet cake recipe and see if you agree that it is the best you have ever had. Cupcakes made from this recipe are delicious, too. I'll often make the cupcakes ahead of time for a holiday and freeze them to make life easier for me during the busy holiday season. Check my post for the red velvet cupcake recipe. Preheat your oven to 350 degrees F. Grease and flour two nine inch cake pans. In the bowl of your mixer (with a paddle attachment) mix the oil, sugar, and buttermilk. Add the eggs, food coloring, vinegar, vanilla and water. Mix well. Add half the dry ingredients, stir and add the rest, scraping down the sides and mixing just to combine. To avoid making a tough cake don't over mix the batter. Pour the batter into the cake pans. Bake for 35-40 minutes until the cake springs back when touched and a toothpick inserted in the center comes out clean. Frost with cream cheese frosting. Cream together the cream cheese, butter and vanilla using your electric mixer and the paddle attachment. Sift the sugar into the cream cheese and butter mixture, mix on medium speed until well combined. Spread a generous amount of the frosting between the layers and on top of the cake. Frosting the sides is optional.